To fully appreciate what makes a Carlisle wide plank floors the finest in the world, you have to understand the unique way in which we first begin selecting the trees which become the carefully crafted boards that will be used in projects where sustainability, fine craftsmanship and heirloom quality materials are desired. In today’s commodity driven world, true craftsmanship and stewardship of the finest raw materials are rare. This is why over the years we have painstakingly build a network of close relationships with sawyers are caretakers of the land and timber that we harvest. Care to understand how the genetics of the specific forest and family of trees will effect not only the environment but how your floor will ultimately maintain an overall consistent grain pattern is not something the majority of sellers of flooring understand. Since 1966, Carlisle has brought back the lost art of crafting wide plank flooring by honoring the inherent, rustic beauty of every board. The versatile grain patterns, organic characteristics and natural wood colorings tell the entire story of the tree. The result is a beautiful, eclectically designed, yet simply stated floor perfect for any style. Every floor is made locally in our New England mill by our craftsmen. At Carlisle, we’ve been working with the same sawyers, some for over 50 years. They’re experienced in securing a premium reserve timber that meets our raw material’s standards of excellence. Carlisle selects each board from the center of the log, never the limbs. We also individually source the timber for each species from an area where it grows best. For instance, Carlisle White Oak comes from the Ohio River Valley where the colder climate slows the aging process and creates tighter growth rings in the log. Our floors endure a grueling 4-12 month double curing process which includes both air and kiln drying before they ever reach our mill in Swanzey, New Hampshire. Once there, our craftsmen are empowered to maximize the artistic characteristics of each board. When laid down, you are exposed to the passionate life of the tree and the organic beauty in each floor. Carlisle skilled craftsmen take time to examine each board, determining which side best represents the full potential of the plank. Each board in your floor has touched the hands of over twenty of our talented craftsman throughout the milling process. Whether it’s our center-cut material showcasing vertical grain for greater stability or the way we patiently wait to harvest, yielding longer, straighter boards, everything we do at Carlisle honors both the life of the tree and its future as a floor in your home. Want to see for yourself? Request a sample of our unfinished wood today. 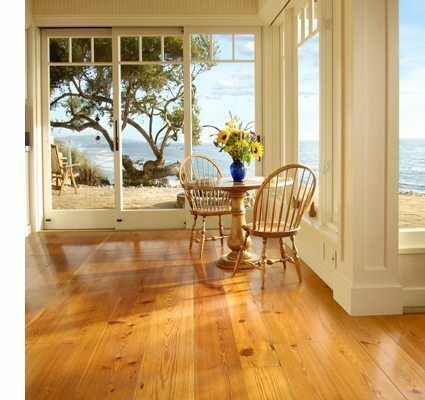 With floors this beautiful, you’ll think twice about adding a finish at all. Take the next step in the planning process, let us outline an estimate for your favorite wood flooring.